Though other countries have used EMV technology for nearly a decade, chips in credit cards are brand-new to the United States. To many Americans, it is unbelievable that such a small change could have such a monumental effect on financial security. The truth is that EMV chips are leaps-and-bounds better than magnetic strips for fending off fraud. It certainly makes you wonder what other fantastic tech could make paying with credit faster, easier, and better than before. Though it certainly seems like the future is now, most experts predict the humble credit card to undergo a number of changes in the coming years. Here’s a sneak peek at what tomorrow’s credit card might look like. Let’s just hope they still offer great rewards. Perhaps the easiest and most likely shift in credit card tech will be the adoption of personal identification numbers (PINs). Across Europe, chip-and-PIN cards have been the norm for about a decade, but American financial institutions only just started to integrate chips into credit cards last year. Unfortunately, instead of opting for identify authentication using a PIN, card companies selected signatures ― to the detriment of cardholders. Signatures are not nearly secure as PINS; in the event you lose your card, a thief could easily scribble any name in the signature line without worry of the transaction being flagged. A PIN is harder to crack, adding an extra layer of protection to your credit. Knowledge of the superior safety of PINS is becoming widespread, and it is doubtless that Americans will be using PINS in a few years’ time. You might know the number on the front of your credit card forwards and backwards, but the short string of digits on the back of your card is just as important. This is called the card verification value (CVV), and it helps ensure you are in possession of your card when you make purchases. Thieves can easily skim credit card numbers, but CVV codes are harder to obtain ― and they could get even harder. Some card providers are introducing cards with dynamic CVVs, which include algorithms that change the CVV with every use of the card. Only the tech within the card knows what new number will unlock the payments, which makes certain methods of stealing credit card information, particularly skimming, entirely ineffective. Biometrics, or authentication through biological means, was the security buzzword of 2015. The possibility of unlocking tech with fingerprints or retina scans is thrillingly futuristic. Initial uses of biometrics in smartphones has caused quite a stir. Plus, biometrics seem inherently secure, as no one else on Earth has the same biology as you. That’s precisely why some credit card companies are beginning to experiment with biometric tech. The most promising developments have come from a Norway-based company named Zwipe, which has built fingerprint scanners directly into their cards. Zwipe is fast-tracking its tech, and you might start seeing signature-less, PIN-less payments in the next few months. Not all forecasted credit card developments are enticing; the credit card of the future just might come with astoundingly high rates. The Federal Reserve resisted increasing interest rates for more than seven years. But, in the final weeks of 2015, it allowed a small rate hike of .25 percent. This small gain has convinced economists that rates will climb steadily higher in the coming years. Though smart credit users should be largely unaffected by the changes, elevated rates can be dangerous. Everyone who takes out loans in the coming years should be prepared. Few people consider the materials that make up credit cards. As the world goes green, the plastics used in your favorite plastic payments are becoming more and more problematic. 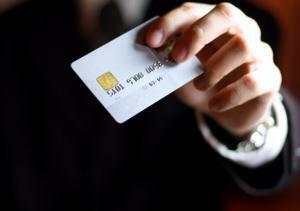 More than 17 billion credit cards are produced every year. The majority are produced from polyvinyl chloride (PVC). This variety of plastic is potentially harmful to the environment. Not only does PVC release dioxins when incinerated, but it takes thousands of years for it to degrade in landfills. Most credit cards live long after their expiration. A few credit card companies are already producing biodegradable credit cards that are eco-friendlier than most plastic payments. The cost of these cards can be 20 percent higher than traditional plastic. So, you might be waiting a bit longer for corn-based credit. It is crazy how long it’s taken banks and vendors to adopt chip cards in the US. I remember being in Europe many years ago and not being able to use my credit card anywhere because it didn’t have a chip in it! I wonder if it will even be cards in the future, as cell phones want to take over that space with iPay and Google Wallet, etc.